I love telling the story about a bunch of French wine tasting experts – including top sommeliers and editors at Le Revue du Vin de France and Le Figaro – who in a blind taste test in Paris in 1976, under the direction of Steven Spurrier, who at the time was a wine shop owner, picked Napa Valley wine over high-end Bordeaux. It put Napa Valley on a course to its current greatness. I was not even 10 years old at the time, much less a wine drinker – despite being brought up in a Greek-American household where we could have a sip of wine at the table. Ah, Old World values. I digress. … If you want to be a genuine wine lover, an open mind and openness to discovery is mandatory. True wine lovers anywhere in the world thrive on open minds! And such was the group of open minds that Jerome Hatt in Strasbourg gathered. French wine lovers who know and appreciate wines from all around the world. Including Jean Frederic Eckert, an old friend who has been working for many years now at one of the best wine boutiques I know, Au Millesime in Strasbourg. We gathered for a blind tasting of six wines – three French, three New World, plus a surprise seventh over a buffet dinner. It was far from comprehensive, but it varied enough to make it thoroughly interesting – and surprising, too. Let’s get too it, shall we? Six wines served blind, all red. In pairs of two. HERE is the photo of the wines unveiled… but first read the notes! The first wine showed some brett, horse like aromas, but not too much. It was sweet and rather up front, and I was thinking Gigondas? A southern Rhone Grenache? But the second wine displayed a more reticent nose and then a rather classy – very Pinot Noir – flavor and texture. It was quite rich, and I was at first thinking a very good New World Pinot. But then time in glass displayed distinct limestone like freshness, and then a touch of vegetal on the finish… This had to be a Burgundy, so the first one was probably New World. The surprise was the second wine, which came in third in the tasting: Clos des Lambrays 2004. Shocking because 2004 is a bad year for Burgundy, known for its green, er, “qualities” – very likely the worst from 2000 to 2010. But the hard work of director Thierry Brouhin pulled it off. This made me bow my head to Clos des Lambrays more than I have already done so… and I would encourage anyone reading this to buy some! Not necessarily 2004, but certainly 2001, 2002, 2005, 2006, 2009, 2010. Even 2003 is very nice from this estate. The first wine was a sweetish Pinot Noir from New Zealand – Felton Road Pinot Noir Central Otago 2010. Probably the second least appreciated of all six. It was better with the simple food we had (simple food is best for wine tastings). So whilst chomping on cheese and pate, I could drink the Felton Road, but it was not exciting. In the next pairing, wine number three smelled like road kill on melted asphalt and we all thought this to be a caricature of Australian Shiraz. And it was… but coming from a rather reputable estate. Before I get to revealing it, let’s go to number four, which was clearly Syrah from the northern Rhone and Cote Rotie. We most all agreed on that. Clearly better than the third wine, in this case. 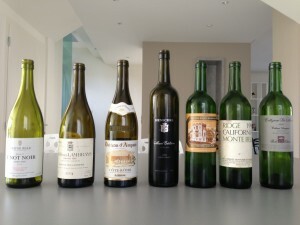 The third wine was … Henschke Mt Edelstone Eden Valley 2005. It was far better on the palate, but I could not get past the thoroughly obnoxious nose. My least favorite. Over time, I could appreciate perhaps the concentration on the palate, but even there, I felt like this was a wine made to impress you rather than please you. One taster commented that it would be hard for two people to finish the bottle… Perhaps. Perhaps it was just a bad showing or the vintage was not that great. In any case, it did come in second to last for the entire group, perhaps out of respect of the sheer concentration? Compared to the sweet simplicity (in this case not a compliment) of the New Zealand Pinot. The fourth wine, far more subtle, disappointed as well because people expected more stuffing… Indeed it was the Guigal Chateau Ampuis Cote Rotie 2005. Good, but not great. We revisited later over dinner, and it was good – certainly showing refinement – but it just did not wow anyone. And when a wine costs about $80-100 per bottle, well, you want wow. Don’t you? Then came perhaps the best pairing of the evening. Two Cabernet-dominated blends. One from Napa, one from Bordeaux. Judgment of Paris, 1976 reprised? Close! It was hard to choose one over the other, as I liked wine number five more than wine number six at first, but then wine number six grew on me… in glass. Wine number five had some floral elements that made it St Julien. Most all came to that conclusion. I thought it was Gruaud Larose, because there was a meaty, iron and even slightly bretty nature. But Jean Frederic called it correctly from the start: Ducru Beaucaillou, from a good but not great vintage. 2001. I remember trying it from barrel at the chateau… Preferring it to the 1999 which was tasted side by side. And I remember the lovely rose notes on the nose at the time (August, 2002). This evening in Strasbourg – 28 October, 2012, over 10 years later – I really enjoyed the earthiness and fruit and floral elements. It was pretty much my favorite of the six. Is it worth the $80-100 per bottle? I thought it was more evolved than 2001, having guessed as old as 1988 or 1995 Gruaud! When I bought a six pack en primeur for $50 per bottle, that was a good investment, but today… I could think of other wines to buy for the current price. Still, a pleasure to drink now. Wine number six at first seemed disjointed. But impressive, especially on the palate. There was an odd acidity spike, as if the wine were acidified. But over time that settled and one appreciated its smooth texture and finely grained and fresh tannins. There was indeed some eucalyptus typical of some Napa Valley Cabernets and it was indeed a Ridge Monte Bello 1996! Very nice. I had no clue what the wine was when asked, and the French participants were thinking, “Panos, you’re an American, you should know!” Oh well… To be fair to the Ducru, there may have been a mismatch, because the Ridge is a more expensive wine, and the Ducru was not coming from a top vintage, either. It may have been better to have paired the Ridge with a Bordeaux first growth. Needless to say: the group picked the Ridge as the number one! But what perhaps stole the show was another wine served blind at first for a buffet dinner after the tasting: a very juicy, and slightly smoky, Cabernet. At first I was thinking New World, as it was so fruit driven, but it had a refined aspect to it, and many participants were sure it was Bordeaux. Sociando Mallet 2005, someone said. Another one thought it was Pontet Canet 2008. I thought it was 2008. Egads! We were all way of the mark. It turned out to be a wonderful Cabernet from … Tuscany from the … 1998 vintage! Tasting far more youthful than one would think, the Collezione De Marchi Isole Olena 1998 from Toscana was smooth and full of flavor. One can still find it for about 60 euros in Italy, but that may be the lowest price. Worth every eurocent… Perhaps not as deep as the Ridge, and not as tertiary as the Ducru, but youthfully delicious. Certainly a show stealing wine!